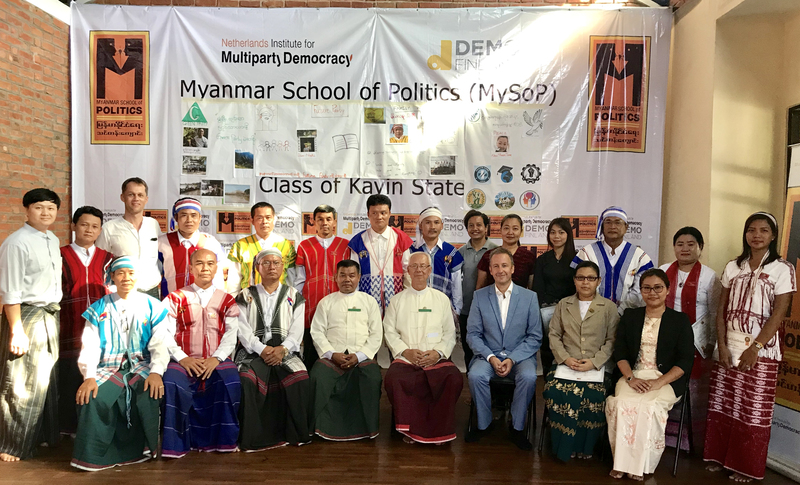 The Myanmar School of Politics (MySoP) successfully completed its 13th Core Course, an intensive political training course for Kayin State, on 15 November 2018 at Bago Metta Center. Held in Myanmar’s Bago Region, the course brought together 14 state-level senior politicians from 6 political parties and one official from the Election Sub-Commission (Kayin State) to engage in dialogue and learn together in a neutral, respectful, multiparty setting. The 17-day long training programme enhances the political knowledge and capacity of the participants, and supports dialogue among the different political parties based on the principle of multiparty democracy. The participants also study political theory and practice their democratic skills together. The course equips participants with skills on how to be a state-level politicians, such as policy-making, speech writing, political dialogue, debate, campaigning and gender mainstreaming. During the closing ceremony, speeches were given by H.E. Wouter Jurgens, Ambassador of the Netherlands in Myanmar, and U Mann Kyaw Win Maung, Chair of the Election Sub Commission of Kayin State. “Although you come from different political parties, I do believe you built good relationships that enable you to embrace different perspectives so that you will find the best solution through dialogue” said U Mann Kyaw Win Maung. He then encouraged the politicians to apply the skills and knowledge that they had learned from this training in Myanmar’s Federal Democracy state building.